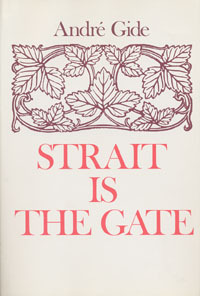 André Gide was thoroughly familiar with the subject of Strait is the Gate - love between cousins - for in 1895 he had married his young cousin Madeleine. The difficulties of this marriage had a powerful influence on Gide's fiction, for Madeleine was puritanical in her Christianity, while Gide was devoted to the sensual. This conflict between his religious and "pagan" sides was one of the underlying themes of all of Gide's writing.